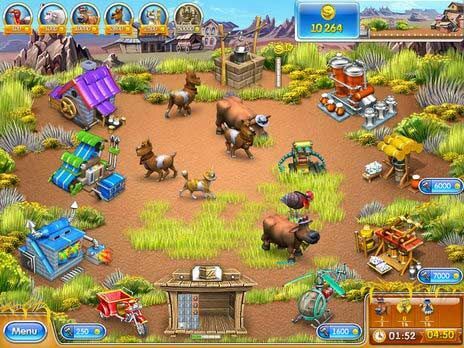 Download Farm Frenzy 3 - American Pie for free at FreeRide Games! America prides itself on being a global leader when it comes to technology, and it's no different on Scarlett's farm! 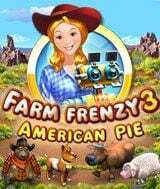 In the fast-paced Time Management game Farm Frenzy 3: American Pie, you assume the role of go-getter Scarlett, who in addition to demonstrating farming prowess with the usual suspects of farm animals, also uses Robots to make her farm super productive! Farm Frenzy 3: American Pie is addictive from the start. As you advance through 90 levels of frenzied farming, you must buy animals, trap predators and use your egg, milk and wool produce to manufacture farm fresh goods, like powdered eggs, cookies and cakes. The twist in this Farm Frenzy game is that with the help of robots - although more expensive than cows - is the benefit if increased productivity. It's positively revolutionary, All American farming at its frenzied best! Brilliant animation, easy learning curve, and an all-new Endless Mode in Farm Frenzy 3: American Pie guarantee hours of entertainment.